Ilam, Jan. 15: Agitating Prof Dr Govinda KC and Bijay Thapa, who are staging a fast-unto-death over the medical education bill putting demands just opposite to one another, have been admitted to Ilam Hospital after their health condition deteriorated. Thapa is staging the hunger strike since January 11 demanding the House to pass the Medical Education Bill in its original form that was passed from the Education and Health Committee of the parliament. He was admitted to the hospital on Tuesday after he complained of pneumonia and other infections, according to Dr Bijendra Shah of the Ilam Hospital. 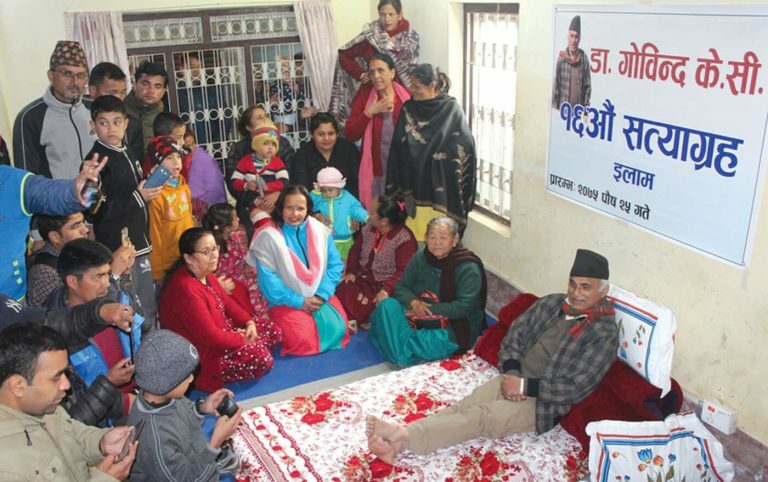 Thapa had turned down repeated requests for admission to the hospital some days ago.